Bowling offers unlimited fun, however, bear in mind that a sloppy bowling ball can jeopardize your entire performance. It’s very crucial that you find your perfect bowling ball so that you can deliver an outstanding performance on every throw. Finding the perfect match isn’t as easy as it sounds. There are countless options and a tremendous amount of factors that need to be considered. 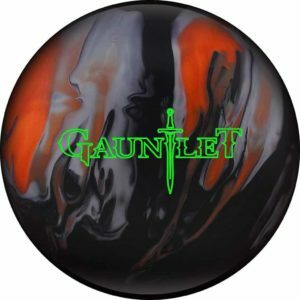 In this article, we will give you an in-depth review of the Hammer Gauntlet bowling ball to make that daunting task a little easier. Without further ado, let’s jump into the review. The Hammer Gauntlet is an absolute powerhouse that offers tremendous performance on the alley. One of the reasons for this is it’s asymmetrical Gauntlet core, which has been developed by Hammer fairly recently. The asymmetrical core makes this bowling ball rather aggressive on the lane, which would be great for players who want to perform sharp hooks both on the mid-lane and backend. Needless to say, such a core would require quite a considerable skill level from the player. If you’ve been playing with simpler beginner balls and want to step up your game, do keep in mind that the Hammer Gauntlet is most likely going to be difficult for you to tame. However, if you do master its behavior, then you should be able to perform virtually any shot. The Semtex Hybrid coverstock is the second and arguably the most important component in the Gauntlet ball. The core has its own share of investment in the ball’s hooking potential, but it would be for nothing if not for the coverstock. This ball is designed to perform on heavily oiled lanes as the coverstock gives it a dull surface that picks up the oil. And, most importantly, the coverstock significantly invests in the capability of this bowling ball to perform sharp and aggressive hooks on the mid-line and the backend. The RG differential in this bowling ball is the thing that testifies to its mid and back-end aggressiveness. Rated at 0.050, the differential of the Hammer Gauntlet bowling ball has a mid-high flare potential. We say mid-high because RG between 0.051 and 0.08 is usually considered high, and the 0.050 differential in this ball is just shy of being high! Now, this ball definitely isn’t the most aggressive out there. And it doesn’t really need to be – who said that the best bowling ball out there is going to be the one that has the most hook potential? However, it has got plenty of hook potential to allow you to hit separated pins into a spare. And hitting strikes would also be easier with this ball! The Gauntlet has carbon infusion on the core and on the coverstock, which makes it one of the most robust bowling balls available out there. While bowling balls aren’t the easiest nut to crack, the increased durability of the Hammer Gauntlet could make it a much longer-lasting investment. The Hammer Gauntlet comes in three weight variants ranging from 13lbs to 15lbs, which should allow most of the people out there to use it comfortably. We’d like to see more weight options for this bowling ball though. Some other balls on the market come with as many as 10 weight options! When it comes to looks, the Gauntlet is an absolute stunner. The design won’t impact the performance of this bowling ball in any way, but if you do care about the looks of your ball, then you’ll appreciate the aggressive color scheme of the Hammer Gauntlet. It accentuates the aggressive hooking potential of the ball, as well as makes it an eye-catcher. The Hammer Gauntlet is not an average Joe, it’s a high-performance bowling ball that offers incredible performance. It would be an excellent choice if you are an advanced player who’s looking a great ball to hook. The price of the Gauntlet is a bit on the steeper side, but, hey! Who bought gold with a nickel? This ball is an animal on the alley and it will smash the pins on every throw. If you’re a beginner, then this ball definitely isn’t the right choice for you since it will be too difficult for you to master. You’ve yet to refine the basics of bowling, so the aggressiveness of this ball would just confuse you. Overall, the Gauntlet is a masterpiece by Hammer that has an amazing flip down the lane. If you’re someone who finds oily lanes to their forte, then think no more and get your hands on this beast.